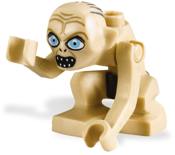 Gollum, previously Sméagol, is a minifigure from The Lord of the Rings and The Hobbit: An Unexpected Journey theme released in 2012. Gollum is a small hunched over figure with bent legs and separated arms that you must put on during assembly. Because of his unusual shape, the smallest brick his body can stand on is a 2x2. His head and body are one piece. The majority of him is tan. He features a stud on the back of his body and has a brown undergarment. The head features two ears, one on either side. The face printed on him has large, blue, evil-looking, eyes and a black mouth with 7 sharp, bent teeth on the inside. On the top of his head there are 9 gray lines depicting hair. The One Ring can fit in his hand, on top of his hand like a normal minifigure can, and on the stud on his back. The sets that feature Gollum always include a fish and a cave. Most Lord of the Rings and Hobbit sets contain 2 or 3 rings so that it is always easy for Gollum to find his ring again. 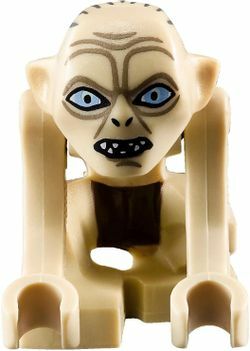 Gollum only appears in two sets; one from the The Lord of the Rings theme and the other from the The Hobbit theme. Gollum, originally known as Sméagol, was once a Hobbit. The name Gollum was derived from the gurgling, choking cough he made, which is known to some as a gulp. His life was extended far beyond its natural limits by the effects of possessing the One Ring. At the time of his death, Sméagol was about 600 years old, a remarkable age for a creature that was once a Hobbit, but he had been deformed and twisted in both body and mind by the corruption of The Ring. His chief desire was to possess The Ring that had enslaved him, and he pursued it for many years after Bilbo Baggins found it while walking in the Misty Mountains. Gollum both loves and hates the Ring, as he loves and hates himself. His diet consists solely of raw fish and goblins that come from the tunnels above him. He was caught by Frodo Baggins and Samwise Gamgee as they were journeying to Mordor in The Lord of the Rings: The Two Towers and he offered to lead the way, while plotting to kill them and take the Ring for himself at some point. At one point he led Frodo and Sam into Shelob's lair, in attempt to kill the hobbits. Later on at Mount Doom, he attacks Frodo and Sam and bites off Frodo's finger to get the One Ring. Gollum then dies by accidentally falling into the Cracks of Doom, and cries "PRECIOUS!". He then burned in the molten lava whilst holding the ring to his chest and smiling which later turned to that of horror and fear when he fell into the lava, and the ring was destroyed with him, defeating Sauron forever. After his death, Frodo forgave him, as Gollum was not actually an evil being, but a poor one bound to the Ring's will. If Gollum had not have fallen into Mount Doom and destroyed the Ring, the Nazgûl would have gotten it and Sauron would have returned to power. Gollum was once a clever Hobbit waterman named Sméagol. The Ring came to him on his birthday many years ago, and he became obsessed with it. The price he had to pay to possess it was cruel and neverending. It has kept him alive for 500 years, yes, but it has driven him mad and turned him into the wretched creature he is now. He has forgotten almost everything from his once so simple and happy life. He has even forgotten his own name. He will never be rid of his need for the Ring. Gollum was once a Hobbit-like creature named Sméagol. For years and years now, his body and soul have been poisoned by the power of a small, plain, gold ring that he has kept hidden deep in a dark cavern within the Misty Mountains. Gollum does not know about the true nature this Ring. He only knows it is more “precious” to him than life itself. After a chance meeting with an intruder in his caves, Gollum discovers he has lost his “precious”! He suspects, quite rightly, that it is now in the hands of one Bilbo Baggins, a Hobbit of the Shire. And so begins a pursuit that will cross mountains and wastelands, span years and cost many lives until at last, this wretched creature will hold the very fate of Middle-earth in his hand. Gollum™ (The Lord of the Rings) Gollum was once a clever Hobbit waterman named Sméagol. The Ring came to him on his birthday many years ago, and he became obsessed with it. The price he had to pay to possess it was cruel and neverending. It has kept him alive for 500 years, yes, but it has driven him mad and turned him into the wretched creature he is now. He has forgotten almost everything from his once so simple and happy life. He has even forgotten his own name. He will never be rid of his need for the Ring.